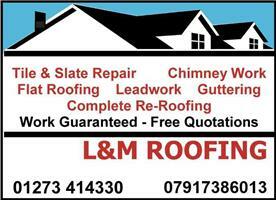 We are a family run company who specialise in all aspect of roofing. We are an established, trustworthy, reliable and professional company based in Brighton and covering all surrounding areas of Sussex. We have over 12 years experience in the trade, use the best quality products available on the market and offer our customers a level of service that is second to none. We believe in offering a professional and reliable service to all of our customers and offer highly competitive prices. Our roofing works and products are fully guaranteed and we have full Public Liability Insurance. We can provide a complete roofing service at very competitive prices. We provide free quotes and estimates, and guarantee a professional and friendly service.